Road/EB is opening a new Road to our Future. We’ve been learning the “hard road of life.” We could relate to the obstacles we see from the ground. EB is guiding a new way. 3 Jaguar/IX established a new way to Live and Create Love in the world. We would find our stability through 4 Eagle/MEN – rising above the world, to create Love from thin air. On Tone 7 we stand in the Balance for a Divine Accounting. 7 Flint/ETZNAB intends to deliver a Divine Truth… a Truth that was hidden or covered up. ETZNAB represents the Flint Knife that cuts to the heart. ETZNAB is also known as Mirror, representing the Obsidian Mirror, a tool of divination that returned the reflection of Truth. So is Tone 7 a symbol of Reflection. At the top of the pyramid, we see All that Is, and All that Is Not. All signs point to a New Truth. Struck Flint produces a Spark. ETZNAB’s Truth is said to be delivered along the path of a Lightning Strike. Lightning always refers to the energy of Chicchan, the “lightning in the blood” that is the Spirit’s quickening in the body. Flint’s Truth will strike the heart. We will Know because we Know. The Meaning and Purpose of Flint’s Truth is to sweep the slate clean. Through a new Truth, we’ll be released from our Human karma. From the ground we’ll be able to see all the obstacles have been swept away from our path on Mother Earth. ETZNAB’s Truth is always unexpected. It will always be the Truth that we need the most Right Now. Our first impression may be “bad news” or “good news.” Whatever it is, this Truth will set us Free. This is a day to Honor the Truth for the Blessing it Brings for Divine Discernment. We can always find our way through Wise Choices when we Know the Truth. Flint reminds us to never be afraid of the Truth. ALL our illusions and fears are born of our own false truth. Flint resides in the North, the place of Wisdom – the Wisdom of the Creator, the Wisdom of the Old Ones, and the Wisdom of Innocence that Trusts Divine Authority. Flint holds the Element of Air, the Breath of Life and Breath of Spirit. Our Lives depend on the Creator’s Breath. Breath and Movement are the signs of Life. A Supreme Creator offered the first Breath to The Creation. The Creator’s first Breath holds the ultimate Authority. Flint is said to present a temptation. It’s a day to avoid impulsive action. No truth will be hidden. Impulsive action will reveal your hidden truth. It’s better to guard our thoughts and learn through Wise Discernment vs the consequences of knee-jerk reactions. Flint’s Truth can just as easily be unexpected Good News. We could receive a stroke of genius. There could be an idea you haven’t been able to see clearly, and suddenly all the pieces fit. Our “bad news” may be that we suffered unnecessarily, and the “good news” is that we never have to suffer again. This Great Law of Creation is an Almighty God’s provision for the limitations of Humanity. The Beauty of Life is Created through this Divine Balancing. The Divine Balance offers Unlimited Possibilities to create the future of our Dreams. We can see the Truth if we look anywhere on Mother Earth. For every Spring there is Fall. What grows Above is growing Below. As a practical application, the Elders taught us to create in different realms. My most beloved plane of creation has been a garden on my balcony. The balcony garden was created here to represent a Transformation of Spirit. When I started, the balcony had been no more than extra storage space. The balcony was transformed to a place with flowers. Then the birds came. The balcony garden was my Spirit’s Salvation. There was no challenge that could disrupt the peace I found, just by looking to the window. I became One with Mother Earth. I had an unfolding reminder of the Beauty I intended to grow in my life. We can plant the seeds of our Dreams. We look to the world to find Truth, but the world only holds the opposite reflection of the Divine Truth Above. Below, our first impression will be the “hard road of life.” We’re right. The journey through the world is the hardest road we can take. Things aren’t “fair” in a world below, because Human is limited. We are Humanly incapable of upholding the Integrity of our own Truth. Maybe that’s the “bad news.” Our Highest Ideals are subject to corruption by the power of ego. The “good news” is there is always a Divine Provision. The Jaguar offered a new path to follow from the realm of Spirit. We thought the worldly way was the only opportunity for Happiness on Earth. We knew all along we like our own ways better. We can Choose to Live by the Truth of Love. The Jaguar waits in stealth in the sacred sites and temples. Like a reflection on the water, the shape-shifter sees another set of stairs Above. At the threshold of Balance we are free to choose between the gravity of the world, or the attraction of Unconditional Love. We only have to take a Leap of Faith to Be in a Divine Realm Above. 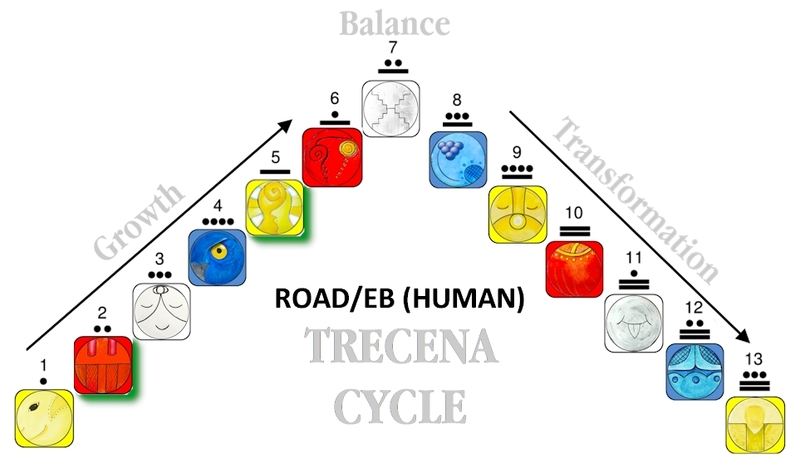 The Road/EB trecena guides Truth of a calendar. All Time holds a Divine Meaning and Purpose. Time is “all that ever was and all that could ever be” split apart into all the unlimited possibilities. Our Spark of Consciousness can experience the Possibility of our Self. We are a Divine Part of the Eternal All-in-One. It’s inevitable that when all the pieces of Humanity are drawn together, our stories would Express the possibilities WE Loved. Equal Time was intended for the Consciousness of Human, and the Consciousness of Spirit. When we find as much Meaning and Purpose living from the realm of Spirit as we do living Below on Mother Earth, we will find the Divine Balance of Happiness in both the Light and the Dark. The Darkness will become a realm of Unlimited Creation in our Dreams. Our lives on Earth Below, will Express the Happiness of our Spirit. We always reflection our Spirit. We know happy or sad when we see it. If we’re Loving, we’re generating the Light of our Spirit. We could change our life by asking, “What would I really Love to do today?” One Loving thing would be born as an idea. Planting the seed with Love, it would grow to Maturity and Multiply to Abundance. We would create a whole new Harvest of Dreams. We could choose the Genius one for the next Harvest. This is Human’s way, Body and Soul. 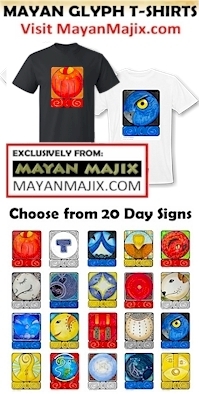 The Maya made a Discernment of Humanity. Like we explore the ways of the Jaguar. Jaguars are raised by their parents, then grow to maturity to live on their own. They reproduce and care for their young as a family. When their kids are raised, they follow their own path. The Tzolk’in illustrates Human’s Way. Road/EB reflects a Destiny on schedule by the Divine Calendar of Human. Love will lead our course. No side-trips for Love will ever lead us off course. From a realm of Spirit we’ll see the winding road as the Direct path to our Divine Destiny. No Time will ever be Lost for the Sake of Love. The Element of Air relates to the faculties of Wisdom and Consciousness. Flint/ETZNAB holds the Power to Change our Mind. To all my relations, may all our doubts about our Self be swept away. May we Know the Truth of our Unlimited Possibilities. May May we Give Thanks for the Means to Know. May we embrace the different way that we do things, as Our Way – one of the Creator’s Unlimited Possibilities of Being. May we Give Thanks for the Time to see the Experience of our own Transformation. May take a Leap of Faith, believing in a world where we could Live doing the things we Love. May we ask to Know our own Divine Way. Cherokee, Flint/DAWI’SGALA: Opener of the Way, a creator, innovator, stretches the mind to outside limits of capabilities. Changes the static to the dynamic. Brings about change, often through separation and destruction. Beams the Stellar Ray of Truth to Earth as a crystal sword cast down along the path of a lightning flash. Flint is the transformer that brings things to a head and wipes the slate clean. I may not comment every day, but please know that I do read every day and it is my daily jumpstart. I call this day. “The mirror reflects with crystal clarity”. I continue strive to ‘master[ing] balance while experiencing CHAOS to achieve rebirth and abundance through infinity,’ as a personal goal to assist me in becoming a positive force in the universe. I am still working hard to remain focused on the right path and to regain confidence in my human powers. Continued appreciation for your unifying Love and informative posts. Seeking my new truths! Much love to you and positive thoughts.